Put on your construction hat, cause it’s time to build! 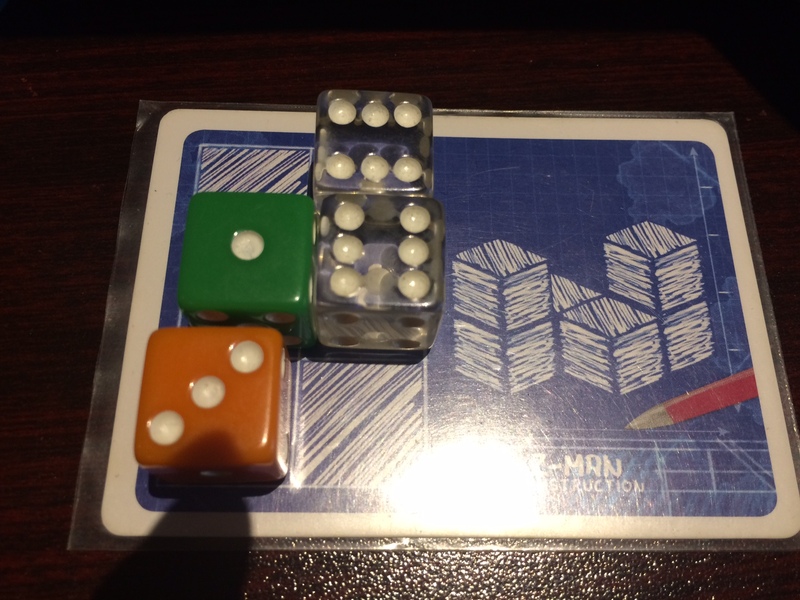 Blueprints is a game that combines dice, cards, and drafting in a clever game about creating buildings while attempting to prove your worth as the best architect around. Does this game have what it takes to inspire you to build to the top? Setup begins by placing all of the different-coloured dice in the black bag. From there, each player will get a screen and one blueprint card, as to not show people what they’re building until the end of the round. The remaining blueprint cards will be placed off to the side, along with prize cards, award cards (not the same thing, more on that later), the scoreboard, and the two materials that are deemed in-demand for each round. Finally, you’ll draw the appropriate number of starting dice from the bag, roll them, then arrange the dice in order by value. Now you’re ready to play! On your turn, you will draw one of the dice from the centre of the table. Then, you’ll place it on your blueprint in an attempt to build the structure to spec. There are a few rules to obey, as you can’t simply place these dice wherever you want. Dice that are stacked on top of one another can only be placed as such if the die going on top is of lower or equal value to the one below it. Once a die is placed, it must stay in that position. Furthermore, you cannot change the value of a die. Yes, you have a screen behind you that prevents players from seeing you perform these shenanigans, but don’t be that person that ruins it for everyone! Finally, you’ll replenish the centre of the table with a new die from the bag to end your turn. After six rounds, all players will reveal their buildings. First, players are scored on whether they perfectly matched their blueprints. If so, that’s worth six points. From there, you’ll score your building based on what materials were used. Orange dice (wood) earn two points for each die that it shares a face with. Black die (stone) earn more points the higher they are on your structure. Clear dice (glass) give you points equal to its top die face. Then we score based on prizes and awards. Prizes are awarded to the player(s) with the highest scores. These prizes vary in bonus points based on where you place. Finally, you check to see if anyone has earned an award by matching specific requirements, such as building five dice high, using four of the same die value, five of the same material, or one of each die value. In the instance of a tie, the player who used the most of the in-demand resource gets the bonus points. The game is then reset and after building two more, the player with the most points wins. The game’s use of cards and dice is certainly unique. I like how the game gives you different ways to score on the same building through different material types. Because of the ever-changing spread of available dice, the odds of you creating the building just the way you want to isn’t always realistic. When the time comes, you still need to decide how to maximize your point potential with the resources at hand. I do have a few gripes though. For one, the awards reward players for being able to achieve specific feats with their buildings. However, most of them aren’t realistic in the course of play. In particular, building five high isn’t realistic unless you get a blueprint that requires you to build to said height. While you don’t need the blueprint to build that high, it’s not worth losing six points for deviating from the plan in order to get two points for building a tall tower. 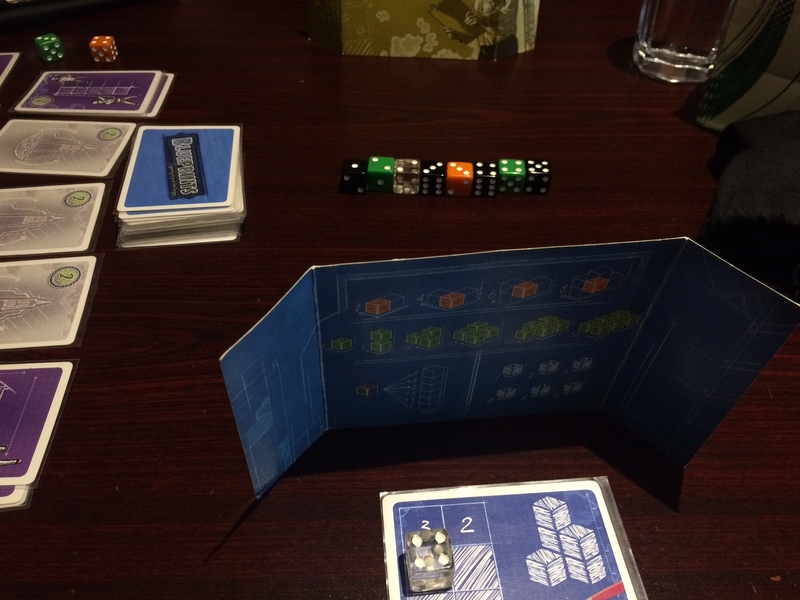 On top of that, by having the recommended spread of dice at the centre of the table, I generally felt like it gives players a few too many good options most of the time. Granted, whether your options are good or bad are largely dictated by the dice rolls, I rarely ever felt like I didn’t have at least a reasonably viable option to choose from. 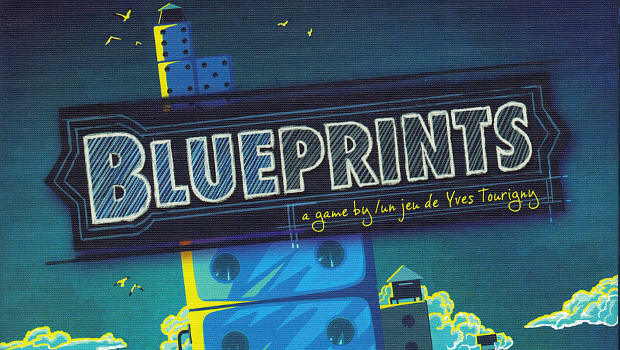 Blueprints is clever in concept and execution, but it’s lacking a bit in punch. I think that its awards don’t do enough to swing the outcome of the game and generally aren’t worth it to strive for. On top of that, I wish that it put pressure on players a little more with a smaller pool of dice to draw from. With both of these in play, it makes for a fairly low-tension competition. Previous Article Pipe Dreams! More Spider-Man on PS4 Action!